On August 18th 1612, eight women and two men were found guilty of witchcraft at the summer assizes in Lancaster. They were all hanged two days later. Three of them - Elizabeth Device and her teenage children, James and Alizon - were convicted, in part at least, from evidence supplied by Elizabeth's daughter, Jennet, variously thought to be somewhere between the ages of nine and eleven. So small was Jennet, that a table had to be brought in for her to stand on so that she could be seen. Whether she could be heard or not was a different matter, as the courts were notoriously rowdy places in those days. For such a young child to be brought in to testify was questionable at best, but she spoke out against her mother, sister and brother and identified others of the accused who allegedly attended a Sabbat on Good Friday of that year, held at her grandmother's house, called Malkin (or Malking) Tower. She spoke of witches' familiars, clay images and curses and appeared calm and collected. As she accused her mother, the poor, wretched woman screamed abuse at her. Included in this motley bunch of suspects were two feuding families. Anne Whittle (known as Old Chattox) and her daughter, Anne Redferne hated the Devices. The feeling was mutual. It seems they were only too ready to accuse each other of various damning acts of witchcraft. The origin of the bad blood between them is unknown, but it certainly proved fatal for both families. One of the most interesting characters in this story is Alice Nutter, who ranked far above the others in social status and wealth but was nevertheless identified by Jennet Device as having been at Malkin Tower on that fateful Good Friday. Alice refused to say one word in her defence - possibly because, far from participating in witchcraft, she was a practicing Roman Catholic, a dangerous pursuit in the intolerant Protestant England of James I. Between them, the unfortunate ten were convicted of no fewer than sixteen murders, along with a catalogue of bewitchings, curses and dark deeds. Their principal prosecutor was the local Magistrate, the ambitious and ruthless Roger Nowell. His methods, along with those employed by the jailkeeper of Lancaster Prison, Thomas Covell, were highly suspect. Although illegal except in cases of suspected treason, there is little doubt that torture was used on at least some of the suspects, in order to illicit confessions. It is also likely that Nowell tricked some of his prisoners into accusing others. 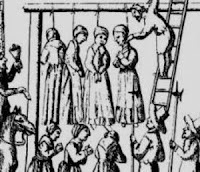 The Trials of The Lancashire Witches in 1612, have been kept vividly alive as a result of a detailed account made at the time by Thomas Potts called The Wonderful Discovery of Witches in the County of Lancaster. He was commissioned to write this by 'his Majesty's Justice of Assize in the North Parts'. Not that his account could ever be accused of avoiding bias! 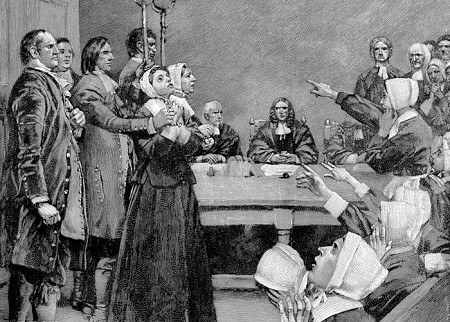 The conduct and methods employed in Lancaster were drawn upon eighty years later when a magistrates' handbook, used at the Salem Witch Trials in Massachusetts, 1692, cited Jennet Device's evidence as a perfect model for the use of child witnesses in trials for witchcraft. Visitors to Pendle today will find little remaining of the buildings significant at that time. Malkin Tower is long gone and its location hotly disputed. Only Pendle Hill remains, brooding over hilly landscape which has changed little over the centuries. The wind whips over the grass, gunmetal clouds swirl and rain lashes down. It can be harsh living up there even today. Lancaster Castle, which houses the former prison and the court (still in use), is open to visitors. On the eastern side is the infamous 'Witches Tower', properly called the Well Tower, which is rarely opened to visitors. A flight of steep stone steps leads down to a grim dungeon, in the depths of which are two large metal rings secured into the stone floor. Here it was that the accused were chained, possibly for up to four months, awaiting their trials. Here the mother of Elizabeth Device, the notorious Old Demdike, died before she could be tried. The walls of this place drip with water, allegedly still contaminated by enzymes belonging to bodies buried nearby. It's not hard to imagine. Two of my ancestors played key roles in the Salem witch trials, Rebecca Nurse and Ann Putnam. It' interesting to note that Rebecca Nurse was originally found not guilty, but no one liked the verdict so the jury was sent back to deliberate again. Rebecca was hanged. Ann Putnam later apologized for her role in the accusations. This is very interesting, Diane, thank you for commenting. Not mentioned above, but another woman accused of attending the Good Friday meal at Malkin Tower was Jennet Preston, from Gisburn, just over the border in Yorkshire. She was tried and convicted at York Assizes a month earlier than the Lancaster Trials. She had originally been found not guilty of witchcraft at the March Assizes in York but evidence supplied by James Device - and not necessarily obtained voluntarily - ensured that she was re-arrested. Her husband attended the Lancaster Assizes in order to denounce James, who had attemtped to retract much of what he had earlier stated under extreme duress. Hi, I live in Lancashire so thought it would be appropriate to do my EPQ on the Pendle Witch trials in relation to other 17th century trials in England/Europe. I found the above information very useful for a general overview but I wondered if you could recommend any resources or ideas I could use in my research, thanks!!!! Hi Anna. Apologies for the delay but I've been away. 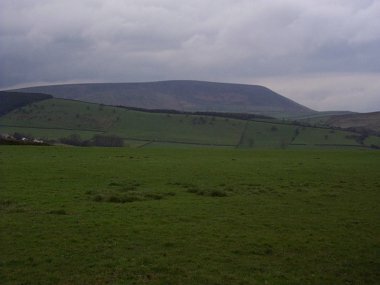 I have recently written a novel on the Pendle Witches and I found the following books very useful: 'A History of the Pendle Witches and Their Magic: Wicked Enchantments' by Joyce Froome and 'The Lancashire Witch Conspiracy: A History of Pendle Forest and the Pendle Witch Trials' by John A. Clayton. Both are avilable on Amazon and elsewhere. Good luck!